Improve Swimming Speed Part 3 | Mediterra - Swim & Run Better Than Ever! So, in the previous essay we have seen how swimming speed and ease can be broken down into a pyramid of interdependent skill sets. 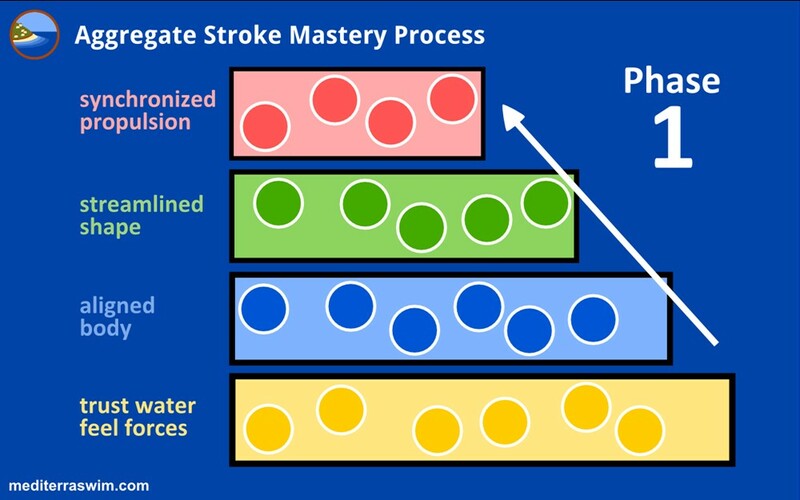 In your stroke mastery and performance improvement process you need to work through this cycle several times, gradually deepening your attention to details each time you go through the process. You cannot perfect it all with one pass through. Speed will not come from a trick, but from a process built on a solid understanding of How Swimming Works, according to physics and human physiology – not dogmatic swimming tradition that works only for the naturally gifted. Get a good process and understand how it works. Make several passes through the process. Set expectations appropriate to the current stage in the process. Incrementally increase challenge level (for body and mind) on each pass through. The first time the swimmer goes through the stroke building process she will learn major ‘gross motor‘ chunks of skill – big stones. These will make a great difference in her sense of ease and control, and a little boost in speed because of the enormous initial energy savings. How to create relaxation, alignment, shape. How to focus the mind on productive focal points. The major sensation of this phase: I can swim so much EASIER. After spending months imprinting the new gross motor skills (for it takes thousands of mindful repetitions, over weeks, to make a good pattern ‘automatic’), much of this will feel more natural, allowing her to maintain those actions without thinking about them. Because of this, on a second trip through this skill building process her sensitivity will increase and she will be able to notice and hold attention upon finer details in the stroke – medium pebbles. How to hold relaxation, alignment, shape, timing over longer periods of time. How to detect then correct major drag problems while swimming along. How to select more (personally) effective focal points. The major sensation of this phase: I can swim so much FARTHER. With the energy saved from superior alignment and shaping the swimmer can spend it at her discretion. This is most often experienced as an attraction to swim longer, to swim farther than before – just because it is so easy to do it now, without raising the heart rate (or even feeling it go down!). Longer uninterrupted distances provides the swimmer with an advantage that accelerates learning further – she gets more uninterrupted repetitions* for examining and adjusting of the stroke pattern – this has a profound effect on the swimmer’s sensitivity to the finest details in the stroke – the fine grains of sand. *Note: The swimmer needs to aim for optimal periods of uninterrupted attention that support neuro-muscular development – one can stop too soon, or try to push too long. Changing your focal point after a period of time will allow you heightened/optimal sensory input. As a guideline you may aim for around 2-5 minutes per focal point (or blended set of focal points), but pay attention to when your sensitivity decreases or your brain seems to crave higher stimulation. This is the cue that you need to give your sensory system a new, fresh focus. How to finely adjust shape and timing to improve ease and improve speed together. Synchronizing full body motion for smoother propulsion. How to identify and use the most productive set of physical and mental focal points for a practice set, or swim, or race. The major sensation of this phase: I can swim so much FASTER. This is the point at which she will, if persistent in the process, tap into the Accumulation of Small Advantages and start encountering bumps up in skill (i.e. speed) as normal. Going from non-swimmer (or struggler) to swimming-easily is a matter of getting some major skill stones in place. Going from swimming-easily to swimming-faster is a matter of deepening awareness and control over finer details, having them accumulate and work together. Going from swimming-faster to phenomenal-swimming (think: age-group champion) requires the interest in detail and dedication to process that a martial arts black belt would require. Nobody earns their black-belt after a weekend workshop and a couple trips to the pool to see if the ‘tricks’ worked, no matter how gifted they were coming in to that event. The higher you want to go in achievement, the more quality time and attention you will need to invest to get there. I hope you are aware that there are no short-cuts to your highest performance. But I also hope you are aware that some paths are much better than others. Working hard is not enough – working smart is the only way. So, I really want to encourage – or even challenge some of you out there who feel the impatience to ‘get fast quick’ or feel tempted to slip in a lesson or workshop or study a video a few weeks before your big race event. If you dabble in TI (or any program) don’t expect bigger or more consistent results from it. You will not see great improvement until you adjust your approach and your attitude to match the reality of what great swimming skill requires. One thing we do is help new TI students (especially those who have a longer competitive swimming background, yet are stuck at some level) understand this process and set expectations accordingly. Almost always, the swimmer is stuck because there is a gap in the skill foundation and a hindrance in their cooperation with the process. Ignorance of How Swimming Works and How Improvement Works. Lack of quality (attention, planning) in training. These are all antithesis to Deep Practice. And Deep Practice is the key to reaching your highest potential in this activity or just about any other. As an exercise in your training journal today you may take some time to do an inventory on your mindset and patterns to see if you struggle with any of these. Then consider how you can make an adjustment in your attitude and practice to strengthen that area. So, if you struggle in getting faster, you may consider if that is a result of a deficiency in one of these areas first, instead of persisting in your current training methodology while expecting new results from it. If you do feel you have a need for improvement in one of these areas, then you are exactly the kind of person we can help with Total Immersion. Matt: You may remember me from a previous “Help for Sinkers” correspondence. I take great inspiration from this set of posts. You have not introduced new material in the core curriculum of TI stratified fundamental skills, but have re-introduced them within a format of recurrent cycles of progressively finer degrees of granularity (you call it Aggregate Stroke Mastery Process) that makes absolute sense to me. I have recently embarked on a new round of focussed time and increased frequency in the pool with a specific focus on fist swimming drill that I have chosen out of sheer desperation with failure to “get” a satisfactory high elbow catch in the water as opposed to on dry land. Whether it was wise to devote so much time and effort to this one skill is beside the point now, as after a month of intense effort, I have finally managed to get it, at least to a point where I can start working on it in the context of whole stroke and with other skills layered on, or perhaps returning to re-focusing on balance and streamlining again, as per your present post. I was aware that my speed was not changing much, but that my ease and comfort in the water has improved during this past month of stroke improvement process. I had taken the philosophy that the one skill learned was a very good thing, as was the improvement in comfort in the water, and that the TI process would look after itself and me in the long run. If I had any niggling doubts (due to the lack of resulting speed-up) that my efforts were generally well directed, you have put then to rest with the very valid comments that swimming is a very complex skill, whose manifest results may come after many, many hours (and possibly years, I am prepared to believe) of meticulous attention to detail, and mastery of same. Finally, I really appreciate you comments about martial arts and the parallel insights with swimming at the TI level. Interestingly, I started Hapkido, a Korean martial arts at the advanced age of 50 for fitness and as a family activity. I found it a little awkward at first but soon found a focus that had me captured. My wife and daughter quit after a few years, but I was captivated by the process, and the skills acquisition, not the belts, which seemed to me merely to come in passing, as it were. Soon I was the oldest member of the club, but by no means the least accomplished. I obtained my 3rd degree black belt last year at age 65 and although the testing was difficult, I laugh at the degree of intimidation I remember feeling after 5 years of training when testing for my first black belt. I realise now, in retrospect, that continuous gradual improvement contributes to huge incremental gains, and that my present skills would have been difficult to acquire in a more compressed time frame. I started TI to compete in triathlon at age 64. Although my swimming speed seems to have hit a long plateau, your comments jive with my own life experience, and I am tremendously encouraged to stay the course of relentless chasing down of detail with a view to eventual mastery (even if the theoretical intersection of that trajectory with the horizon is at infinity lol!!) as I reach age 67 next month. Thank you again for this insight. Hello Su-Chong – I do remember you. And, wow. I could not ask for a more encouraging, complementary testimony than what you gave here. You seem to understand that we are not making an excuse, or indefinite delay on ‘getting faster’ but respecting the fact that – if we accept the swim-speed-is-primarily-neurologic-skill argument – such speed-inducing neurologic development takes time and deliberate effort. The prize goes to the one willing to cooperate with the process. To repeat the martial arts mantra: Slow is Smooth, Smooth is Fast. We seem to comprehend the slow-to-fast approach in martial arts for making lighting fast, deadly-precise competitors – but ‘brute-force and being tough enough for mindless training’ remains the default human bias in the water, to the detriment of everyone but the most gifted. Your notes about working on the high elbow catch caught my attention. You may be thinking what I am thinking in how you approach this, but for the benefit of other readers I want to make a comment about that. The label ‘high elbow catch’ is a descriptive term of an external appearance – and this may be misleading us in why/how to develop this skill. Our goal is not to achieve a stroke that looks a certain way, but a stroke that accomplishes certain things. It might be more appropriately labeled “Solid Grip Catch”. The purpose of the catch is to get a ‘solid’ grip on the water so we can use the rotation of the torso to leverage our body forward using the most efficient means of power transfer (= low, long-lasting energy demand with greatest propulsive effect). It is not the appearance or shape of an elbow and forearm in a certain position that we are after but that effective grip itself. We are aiming to get a grip on a point in the water, hold that point, and slide the body past that point. Some of greatest swimmers (with exceptional stroke length) actually accomplish this. One determines his success in achieving a ‘solid grip’ by how he feels inside the body (better, more comfortable leverage, and less stress on shoulder joint), by how his arm feels against the high pressure zone of water (holding more water), by lower heart rate (transferring load to more suitable, long-lasting muscle groups, sliding forward easier) and longer stroke length (getting more distance per unit of power). This is how we should measure a ‘satisfactory’ catch. By working inside-to-out, by achieving the internal conditions one will by default produce the catch appearance known as ‘high elbow catch’. But one who tries to work outside-to-in, trying to achieve the appearance without understanding its internal nature may achieve the form but without the benefit it is suppose to provide. This may be likened to a person who practices the external appearance of a martial art, without first practicing the internal centering/grounding that gives it power. Put him in a real-fight scenario and he will get annihilated. True form (fashion, appearance) follows true function. Thank you for making a comment and asking this question. The short answer for you is that you are doing great already. I think you need to give your system time to adapt, while continuing improvement on details that increase ease, rather than distance per stroke – yet those will eventually built critical mass and spill over into a longer stroke benefit. When you are trying to make such a long leap in SPL improvement (from 23 to 15-16?) you may not be able to ‘plow’ your way with linear progress to your ideal in a few months, at your ambitious mental pace. You’ll need to give time for your internal systems to adapt too. You’ve got persistence. I am sure you have patience. Now you can add some understanding to cooperate with your internal development process. How to do that? 17 SPL might be multi-dimensional threshold at the moment. I suggest that you work on making 17 SPL feel better, smoother, more natural, rather than keep pushing to a longer stroke. Allow yourself to work on this ‘plateau’ for some time. (This blog essay might encourage you with that)Meanwhile, as you are continuing mindful, skill-focused practice, the neurological ‘roots’ will be going deeper, setting the stage for your next step up in capabilities. You won’t go from non-swimmer to 9 SPL Shinji-like swimming in 12 months. You’re also retooling your metabolic and muscular system to operate in a way that is probably foreign to what you have done on land over your lifetime. When I made the discovery of TI and gained an SPL improvement of 25 down to 17 (in a 25y pool) it took just a couple months, but I already had 13 years of swim training built into my system. You will get there, but your posture, your join mobility and your musculature will take some time to reform and expand to support this new activity. Those will adapt as you continue to work with skill-based mindset. Just by practicing TI over a few years I and others noticed a positive change in my standing posture and my musculature. I notice a much better range of motion too – all from just being careful, persistent… and having fun with this training process. Penetrating insight, illuminating knowledge, inspired teaching – your writing combines all of these. Hope to see you in Turkey someday and improve my TI skills, particularly open water swimming. TI has – in less than a year – transformed me from a near novice to a person who swims with ease and one for whom swimming is truly a passion now. certified coach in my city – Bangalore, India. I also intend reading all the posts on your blog. Someday, you can select, edit and compile them in book form. Many of your writings deserve to be published. Your ability to differentiate and integrate different threads of knowledge and merge them seamlessly in the swimming context are quite remarkable. You are, perhaps, a swimmer and coach par excellence. The swimming community will hear more about you, Mat. Hats off to you and thank you for all your writing. I continue to learn by reading your posts. Thank you for your generous compliments. I am glad the content is resonating with you, and that these posts represent some recognizable quality for all the heart and effort I put into them. All the coaches in TI that I know personally are also very grateful for the transformation that TI has allowed us to experience. I think our satisfaction in it as swimmers has turned us into coaches, because this is just too good to keep to ourselves! You found Bjorn in Bangalore? I do think I will need to compose some topical books from this stuff eventually – I am currently working on one as a Self-Coaching Manual, already outlined and I am now writing each chapter as weekly letter to my private students as a first draft. But going from individual posts to a coherent, flowing book will be a challenge on the next level for sure. It is a challenge I look forward to. Thank you for the encouragement. And it will take courage to stick it out there on that next level of complexity. Keep me posted on your progress in India and beyond. And please visit us in Turkey some day. I intend to enroll for your online coaching program in due course. I was able to order stuff from the TI website paying online by card. you an email invite to browse some of my own writing online. You mentioned in part 2 about engaging the core…can you provide a description on how to achieve this? Which muscle groups are we trying to activate? My problem is that of low sinking hips and legs as I am quite muscular…my first 50m is usually pretty good but then goes bad from there as I start to ‘fatigue’.